I can’t explain just how happy this meal made me. I loved every single bite. I kicked myself that I didn’t make more because while it was filling, I would have loved leftovers to enjoy all over again. And, if that wasn’t enough, the dinner was healthy and helped to rid the bits inside my refrigerator, including the remaining amazing tahini-ginger dressing that I made the night before. Somehow the cumin-scented vegetables (crush your own cumin seeds, so worth it!) and the ginger, lemon and tahini of the dressing mingle to make sweet, sweet love to your mouth. It’s plain delicious. 1. Preheat oven to 450. In a large bowl, combine the diced vegetables (potatoes to carrots) with the olive oil and cumin and mix until everything is coated. Dump into a large baking tray and bake until vegetables are that perfect mixture of soft and crispy, about 35 minutes. 2. Meanwhile bring the veggie stock to a boil and add in the millet. Turn heat to low and cover until all the liquid is absorbed. Set aside. 3. Steam broccoli for just a few minutes until bright green and crisp-tender. Remove immediately from the heat. 4. Mix up the ginger-tahini dressing. If you don’t have enough leftover dressing, add in the juice of half a lemon and more olive oil. Taste and adjust seasonings. 5. 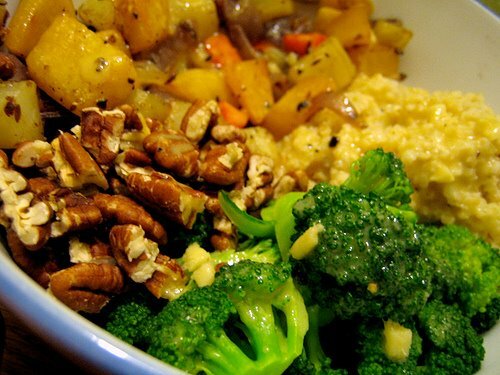 Get out your 2 most favorite large bowls and section out the millet, the roasted vegetables, the broccoli and the pecans into said bowls. Drizzle dressing over top and dig in. Kick yourself because you didn’t make a double batch. Perfect timing kickpleat!! I picked up a bag of millet a few weeks ago at my local bulk emporium and I could not figure out what to do with them. Once the spicy apple lentil dal (yes, your recipe) I made yesterday is consumed, this millet dish is next on the agenda! Wow, I haven’t had millet since I was a kid. Thanks for the flashback and reminder to pick some up! This bowl looks incredible! I’m trying this over the weekend. Thanks you soooo much!!! This is the kind of think I crave after coming home from vacation and eating too many carbs and drinking too much wine. Just healthy goodness. Millet is probably the only grain I have never cooked. And I didn’t know it was so easy! Absolutely agree about crushing your own cumin seeds – big difference. I also love to toast the cumin seeds for a bit first and then grind them – fab! It looks delicious! I was the same way with the ratatouille I finished last week. I was so sad when it was gone. I love making things that everyone looks forward to a repeat on! It is shocking what a difference freshly ground cumin makes. It tastes nothing like the pre-ground variety. Well, maybe a little, but it's much brighter & muskier. Freshly ground cumin is the secret ingredient in home-made salsa. no problem, emily. hope you enjoy it! zlamushka, hope you enjoy it! cheap, this is a great meal. definitely. judy, this all works together beautifully. hot damn, is right, eviedee! dana, i think it’s perfect anytime! millet is easy and delicious, foodess. i’ve never toasted and then ground my cumin *slaps forehead* doh! thanks for the tip, daily spud. i agree, laura. this summer, i’ll definitely be adding some freshly ground cumin to my salsas. I will have to buy some millet and try that out. It looks like the perfect lunch. Never had millet before, but from your great description, I’ve been missing out. Have to try something so healthy and yummy! this reminds me of bi bim bap – a korean dish that puts all sorts of foods in a bowl over rice. that looks soooo good!!! yummy! my only question is what if you don’t like tahini? can you recommend another dressing that would work? That looks awesome, like it would just hit the spot! Especially the tahini-ginger dressing, wow! culinary, yes, you are missing out. millet is great! eric, i guess any kind of bowl could be considered a bit like that. i’m sure an egg cracked over top wouldn’t hurt things much here either! mary, i’m sure just a lemon ginger vinaigrette would work perfectly here (make the dressing, skip the tahini)! thanks irene! it does definitely hit the spot. We made this last night – it was incredible. What a great way to substitute the pecans for a meat portion of the meal. This followed your recipe for Quinoa Green Bean Salad – so loving your site! We’re nourishing ourselves through your recipes. sounds and looks delicious!!! must try! thank you for the recipe! I really enjoyed making this and we loved eating it too! I added beets and blue potatoes. It adds just a bit of sweetness. Also, just made your cinnamon/apple dutch baby- so good! yay, jabba, that is so great to hear! isabella, beets would be so great here. i’ve already made several versions including some with pearl couscous and brown rice (subbing for millet). yum! This was delicious! 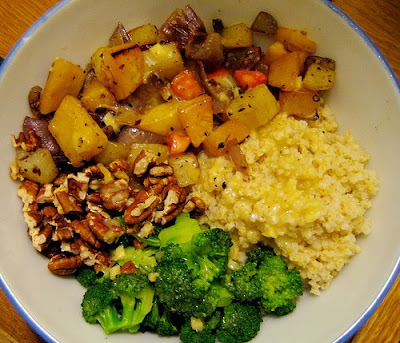 I’m so happy to have found this sight – the first food site that has really inspired me and shown me something new – (millet, pecans with dinner). Thanks so much for so many good ideas that are so veggie friendly. Just made this, sooo good! I never knew I liked rutebegas until now. Thanks!